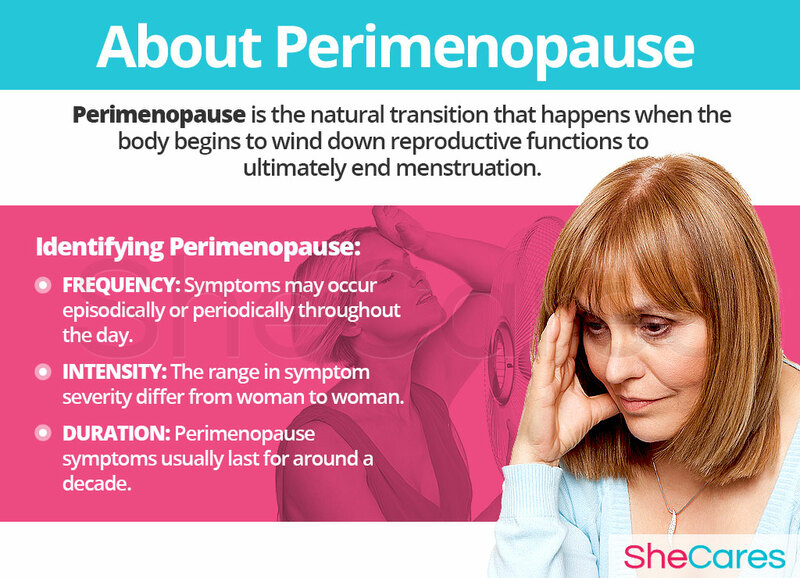 Perimenopause is a natural transition that every woman goes through in her life. During this time, the body gradually winds down reproductive functions, and eventually, menstruation ceases permanently. In short, it is the transition from fertility to infertility. However, this transition is typically wrought with symptoms. This is because of the hormonal imbalance that characterizes the menopause transition – perimenopause. Continue reading for information on the symptoms perimenopause, what causes them, and how they can be treated. All women go through perimenopause at some point. Although in some cases it can happen earlier as a result of surgery, cancer treatments, or genetics. The transition to menopause is typically experienced between the ages of 45 - 55. Menopause is defined as the day a woman has gone 12 consecutive months without a period. In the 2 - 10 years prior to this, she may experience a myriad of symptoms. This transitionary stage is referred to as perimenopause. Since menopause occurs exactly one year after a woman's last menstrual cycle, it is helpful to keep a record of one's cycles, as well as any symptoms or changes felt. Each woman's perimenopause experience is different, so the frequency, intensity, and duration of symptoms will widely vary by individual. 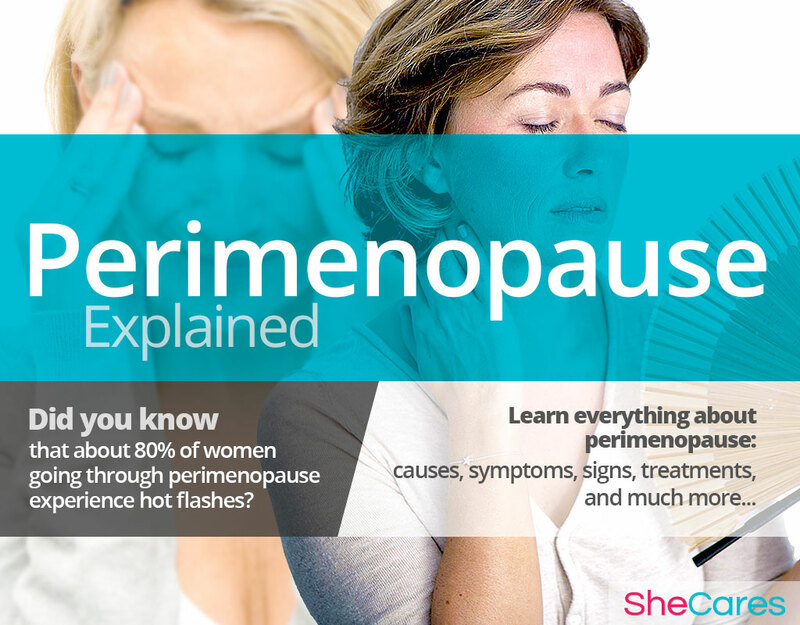 Continue to the next section for information on what causes perimenopause and its symptoms. While perimenopause symptoms can be influenced by a breadth of factors, the primary cause is the natural fluctuations in hormone levels that occur during this transition. These hormonal changes have the potential to affect nearly every part of the body. Hormones like estrogen and progesterone regulate the menstrual cycle. As the body prepares to go through menopause and therefore stop menstruation for good, hormone levels change. However, this is not a smooth, gradual decline. Rather, hormone levels fluctuate up and down throughout the transition before finally reaching consistently low levels. Aside from regulating reproductive functions, estrogen and progesterone have multiple roles throughout the body. For example, they also influence the function of the central nervous system, bone growth, the cardiovascular system, and the skin. For this reason, when hormone levels are out of balance, various symptoms may result. Low estrogen levels is the main form of hormonal imbalance; however, whenever estrogen or progesterone levels are outside of the body's normal ranges, symptoms may be produced. 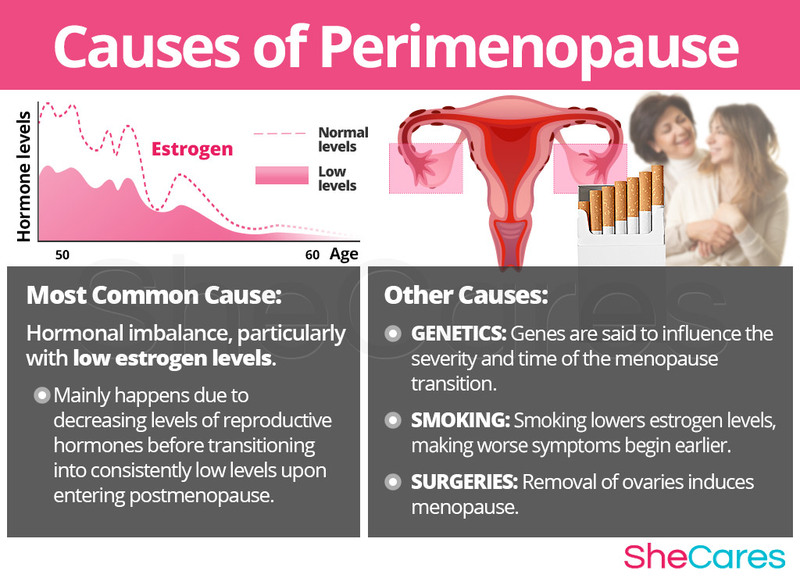 While the root of all perimenopause symptoms is the hormonal imbalance associated with the transition, other factors - like genetics and tobacco- can impact the frequency and severity of symptoms. Furthermore, certain medical treatments can result in perimenopause symptoms. Genetics. A woman's genes are thought to influence when she goes through menopause and how severe her symptoms are. The age at which her mother and other female biological relatives went through menopause can help determine when she will enter the transition. Smoking. Smoking lowers estrogen levels, making perimenopause symptoms worse and potentially bringing them on one to two years earlier. A long-term smoking habit also raises a woman's risk of cardiovascular disease, a risk that is already increased around this time of life. Premature ovarian failure (POF). This poorly-understood disease means that the ovaries partly or completely lose function before age 40, resulting in perimenopause symptoms. Radical hysterectomy. In this surgical procedure, the uterus and other reproductive parts are removed. If the ovaries are removed, this immediately induces menopause. Bilateral oophorectomy. Like a radical hysterectomy, this surgery that removes both ovaries brings on menopause. Certain cancer treatments. Radiation therapy and chemotherapy - especially treatment used to target cancer in the pelvic area - may damage the ovaries, resulting in premature ovarian failure. Keep reading to learn about perimenopause symptoms, as well as the conditions to watch out for during this time of life. Although over two dozen symptoms have been associated with the perimenopause, it is extremely unlikely that a woman will experience all of them at the same time. It is possible however; that she will experience different symptoms at different points in her transition. 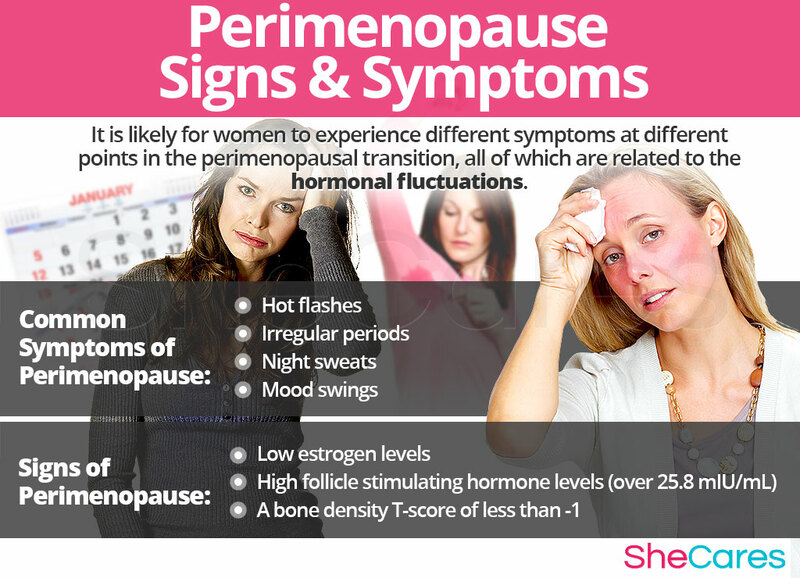 All of these symptoms are linked to the hormonal fluctuations that occur during perimenopause. The following are the most commonly-reported symptoms of menopause. What Other Symptoms Might be due to Perimenopause? In addition to the above symptoms, many others have been associated with perimenopause. They may not be as common, but they have been reported frequently enough that a connection has been drawn with the menopause transition and hormonal imbalance. A woman is not diagnosed as having completed the menopause transition until she has gone one full year without a menstrual period. To diagnose perimenopause, a physician will typically perform three procedures: a review of the patient's medical history, a physical exam, and laboratory tests. While perimenopause symptoms typically do not have any complications, , aging and low hormone levels can increase a woman's risk of developing certain conditions, such as osteoporosis and cardiovascular disease. Women are at particular risk as they enter postmenopause. Although perimenopause is a natural transition, the symptoms it brings can be severe and lower a woman's quality of life. For this reason, many women seek safe and effective treatment for their symptoms. While perimenopause symptoms all have the same root cause - hormonal imbalance - they can have different triggers and vary in intensity. Because of this variance, treatment may be approached from several different angles. Balancing hormone levels through any of these approaches is a significant step a woman can take towards overall wellness. Three levels of approaches can be considered for treating perimenopause symptoms. These are categorized as: (1) Lifestyle Changes, (2) Alternative Medicine, and (3) Pharmaceutical Options. Depending on the severity of the symptoms, lifestyle changes are generally recommended as the first course of action because they entail the lowest risk and also benefit overall health. If they are not enough to relieve the symptoms, a hormone-balancing treatment may be attempted. Medications are typically considered the last resort because they involve the most risk and cost. The first level involves no risk but may be the hardest way to go. Those considering this approach will need to set goals and maintain a positive mindset to achieve these changes. A balanced diet, healthy habits, and regular exercise are the crux of lifestyle adjustments for managing perimenopause symptoms. It's not easy to pursue this approach, which is why most women might want to consider the next level of treatment. Alternative medicine offers options for balancing hormone levels in a natural and safe way. Alternative approaches involve little or no risk. In this level of approach, herbal remedies are the most effective option. Soy and black cohosh - among other herbs - contain compounds that are structurally similar to human estrogen. These compounds act like a weaker form of estrogen in the body, potentially helping when estrogen is deficient. This may counter some of the hormonal imbalance during menopause, but it does not address the other hormones that can be out of balance during this transition, such as progesterone and testosterone. These supplements, such as Macafem, do not contain any hormones. Instead, they function by providing particular nourishment to the endocrine glands. This helps them produce hormones at the level the body needs, resulting in a balance of not only estrogen, but also progesterone and other hormones. Additionally, other herbal supplements may provide relief from perimenopause symptoms. While they may not balance overall hormone levels, they can target specific symptoms. Depending on a woman's symptoms, it may be beneficial for her to combine aspects of both of the above approaches. Lifestyle changes along with alternative medicine tend to manage perimenopause symptoms in a more efficient way than either approach alone. However, those with especially severe or persistent symptoms may like to consider medications, though the risks should be weighed as well. This approach may be more potent, but it also entails more risk than the above treatment methods. 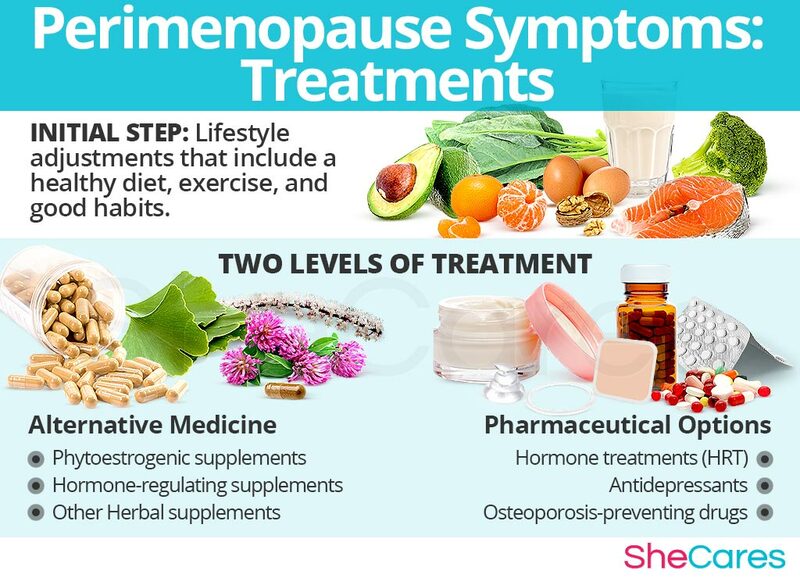 The most well-known pharmaceutical treatment for perimenopause symptoms is hormone replacement therapy (HRT), though other drugs may be prescribed for specific symptoms. The above approaches can be tailored to form a personalized treatment that is best suited to treating the symptoms and other problems an individual woman is having. The severity of the symptoms and the extent to which they impact a woman's daily life influence the treatment route she may take. For many women, lifestyle adjustments and hormone-regulating herbal supplements are an effective combination. Freeman, E.W. (2010). Associations of depression with the transition to menopause. Menopause, 17(4), 823-837. doi: 10.1097/gme.0b013e3181db9f8b. Joshi, S. et al. (2011). Effect of yoga on menopausal symptoms. Menopause International, 17(3), 78-81. doi: 10.1258/mi.2011.011020.